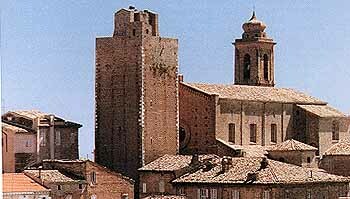 In spite of its name, Sant’Elpidio a Mare, is on a hill, between the valleys of rivers Ete and Tenna. Almost entirely surrounded by medieval walls it preserves, in the old town, interesting monuments and works of art. Its past history is rich of events, now it is an industrial shoe-factory centre and there are more than 15000 inhabitants.